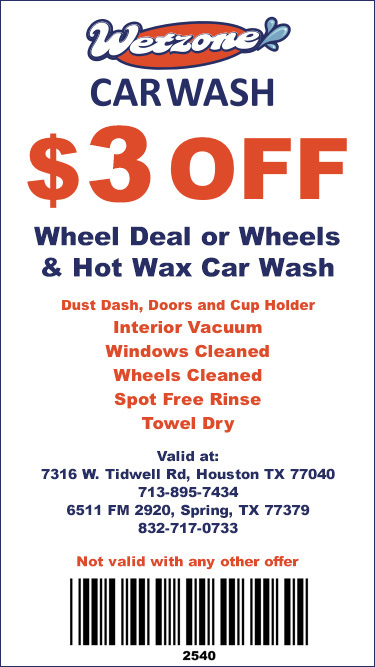 Free Unlimited Vacuums with purchase of any wash.
Package features and prices may vary by location. 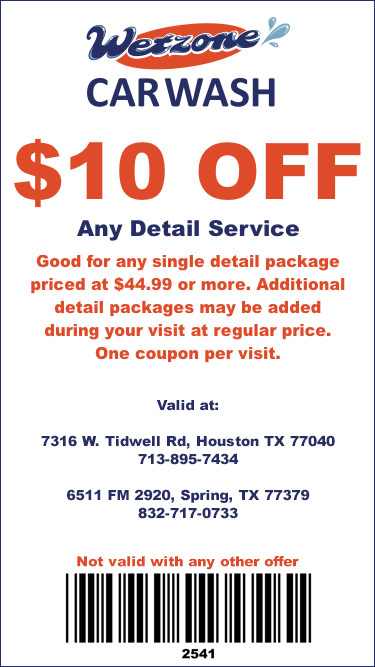 Have you recently thought to yourself “where is a car wash near me that can make my vehicle look its best again?” If so, you’ll be very happy with the experience you have at Wetzone Car Wash. Our convenient locations in both Houston and Spring, TX mean you’ll have an easy time reaching us. Not only do we make it a breeze to find our nearest car wash, but we take a lot of pride in the experience we offer. Instead of being forced to settle for less than exactly what you want or pay for extras that you don’t currently need, we offer a variety of great packages to fit precisely what you want done to your vehicle. 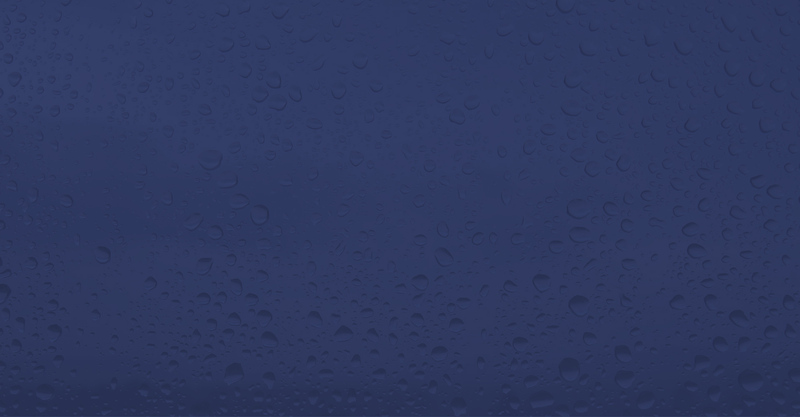 We offer four different Express Exterior Wash packages. Our most popular is the Ultimate Wash. This package includes a soft cloth tunnel wash, spot free rinse, turbo air dry, in-tunnel wheel cleaner, triple foam wax, clear coat conditioner, in-tunnel tire shine and underbody wash. The Ultimate Wash is the perfect way to make your vehicle’s exterior look amazing! If your vehicle doesn’t need quite as much done when you visit us, you’ll be very happy with an Express or Super Wash. And if you want to finish off your vehicle with an incredible shine, our Ultimate Hot Wax package is the perfect option. 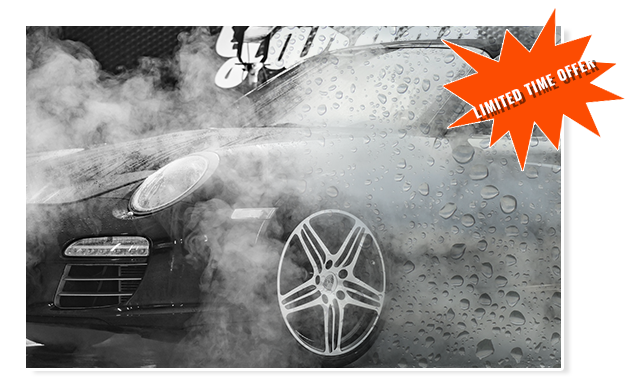 To top things off, you’ll get free unlimited vacuums when you purchase any of our four Express Exterior Wash packages. Whether you’re in need of a tunnel drive through car wash or have been wanting a more hands-on approach to cleaning, the variety of car wash packages we provide in our Flex service car wash environment means you’ll be able to get exactly the type of clean that you want. So all that’s left for you to do is come visit one of our car wash locations and experience what Wetzone Car Wash is all about for yourself!